We are overwhelmed with the volume of items left in our lost and found each week. In order to keep items organized, we are hanging items in the hallway close to the front door. Please ensure your child is checking for lost items on a regular basis. Before spring break we will donate unclaimed items to a local charity. All SD62 elementary schools offer full day kindergarten for our youngest learners. To register, children must turn five years of age by December 31 in the same calendar year that they begin school. Registration for kindergarten is a first-come, first-served basis and normally takes place in January. *Note: Parents MUST attend a Nature K info session prior to registration. Please see Nature Kindergarten page for dates. New to our school district? If your child is in Grades 1-12, registration can be done online throughout the year. 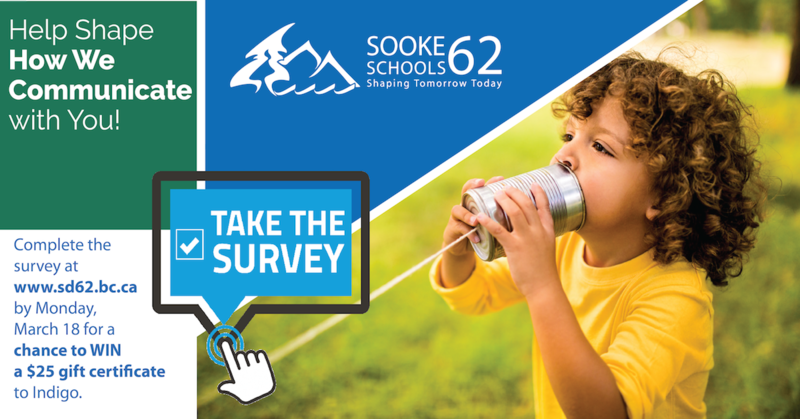 Already enrolled in SD62? If you would like your child to change schools within our district, simply fill out the School Change Request form. There is no need to re-register your child as they transition grades. *We recommend contacting your neighbourhood school prior to registering to find out about available space and resources. Students who opt for Early Immersion usually enter the program in Kindergarten and continue their French studies through to grade twelve. In Grade 12, they receive a ‘Double Dogwood’ (a bilingual graduation certificate). Students may also begin the program in Grade 1. Please visit the French Immersion – Kindergarten page for complete details regarding registration.